You’re pregnant and considering cloth diapers. Or you’re a new mom and considering cloth diapers. 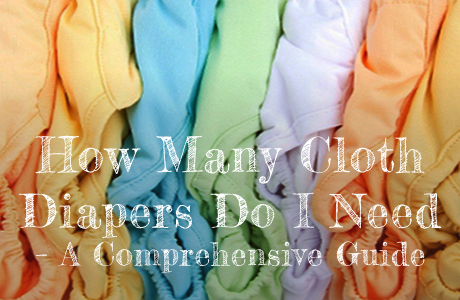 Either way, before you commit, you want to know how many cloth diapers you’re going to need. Also, it’s important to be aware that the number of diapers you need for a cloth diapered baby, is not the same as that for a baby who is diapered with disposable diapers. Well, that’s because cloth diapered babies need to be changed more often than disposable diapered babies. Disposables diapers have chemicals and absorbent crystals in them. This allows them to absorb more liquids AND makes baby feel dry. Cloth diapers don’t have that so once baby wets him/herself, they are likely to let you know because they’ll feel uncomfortable. This is why as a cloth diaper parent, you will go through more diaper changes than a disposable diaper parent. Cloth diapers don’t have that. Once baby wets him/herself, they are likely to let you know because they’ll feel uncomfortable. 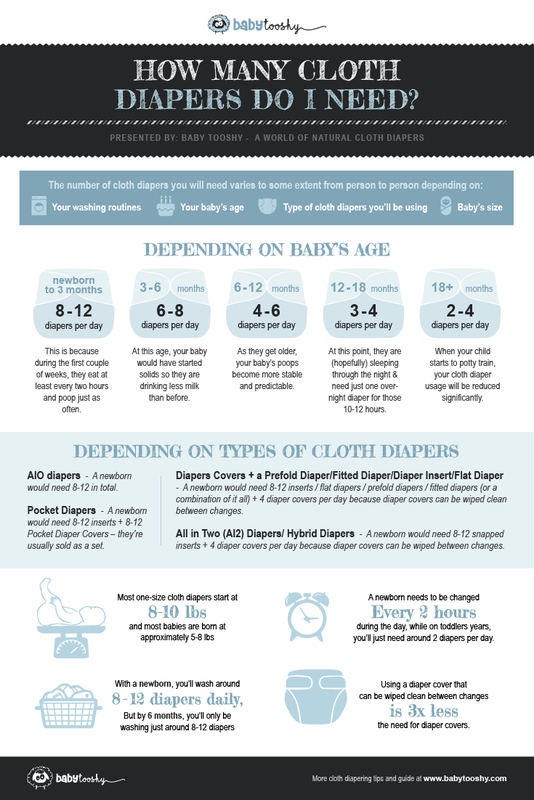 This is why as a cloth diaper parent, you will go through more diaper changes than a disposable diaper parent. 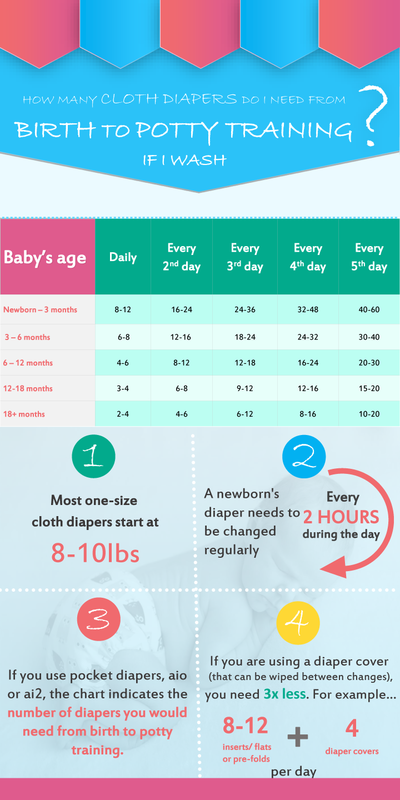 This chart is a great guide to helping you figure out how many diapers to get. For more intense discussion, read further. Newborns go through approximately 8-12 changes every 24 hours. During the first couple of weeks, newborn babies eat every 2-4 hours and poop just as often. With newborns, every meal is fluid – hence, they have more explosive bowel movements and the will pee more frequently. 8-12 Diapers sound like a lot but don’t worry – this is temporary. As newborns grow and solids are added to their diets (at around 4 months), these patterns change to allow for less diaper usage overall. From three to six months of age, you can generally plan for 6-8 diaper changes per day. At this age, your baby would have started solid foods. They are also drinking less milk than before. Their poops may be firmer too but this varies from baby to baby. As your baby learns to sleep longer stretches at night, it’s much easier to make do with fewer diapers. Once your baby begins to roll, crawl, and sit up on their own, you can expect their wetting patterns to decrease. Perhaps at this stage, it might not be so noticeable for you because you’re still doing a lot of laundry. Even at this stage, some babies tend to sleep longer at night. Those babies may also be heavy wetters. That means, they’ll wake up with a soaked diaper. If that is the case, you will likely require a nighttime solution as you move forward. If this happens, don’t worry about it. An extra insert may be enough to stop your baby from waking up soaked. From ages six months to 12 months, you may only need 4-6 diaper changes as your baby’s poops become more stable and predictable. Often as babies get older, their poops become a little more predictable. Their poops can also tell you what’s going on in their bodies. For example, when their poops are more liquidy or they have diarrhea, this may be a sign of teething. But, babies are different so always follow your instinct and contact your pediatrician if something doesn’t feel right. After a year (12-18 months) you might only go through 3-4 diapers each day, with a nighttime diaper. Yeah! Regardless of what your cloth diaper washing routine is, at this stage, you will have much less laundry. Thank heavens for small mercies! Your baby is hopefully sleeping through the night. If that’s the case, he/she needs just one overnight diaper. Toddlers (18 months-potty training) go a few hours in a dry diaper and only need 2-4 diapers a day. When your child begins to gain interest in using the ‘big potty’, your cloth diaper usage will be reduced significantly because your child will no longer be considered a full-time cloth diapered baby. When the time comes for potty training, many parents use their regular cloth diapers at night and training pants during the day. Particularly in the beginning, expect that you will need around 4 training pants. This may seem like a lot but your training pants will likely get soiled often. The good thing about cloth diapered babies is that because they feel uncomfortable sooner than disposable diapered babies, they tend to learn to potty train sooner. However, never fret about the timeline. Some babies potty train as early as 18 months – (not any of my kids) – some after 3 years. There are various factors that go into play when it comes to potty training. The time when your child starts to potty train is no indication of their development. To figure out the number of cloth diapers you need will also depend on the types of cloth diapers you plan on getting. If you’re new to cloth diapers, you may be confused with all the cloth diaper terms and abbreviations. 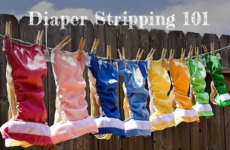 We cover the types of cloth diapers in depth in another article but here, for the sake of trying to figure out how many cloth diapers you need, I’m going to try to make it as simple as possible for you to understand. In that attempt, I’m going to explain cloth diaper types in terms of simplicity and costs. Step 1: You put it on your baby, just like you would a regular disposable diaper. Step 3: You remove the diaper and throw it in the diaper pail until wash day. That’s it, basically. Except if baby pooped. Poop must be tossed into the toilet before the diaper gets washed. If you choose All in one Diapers, a newborn would need 8-12 in total. All in one diapers have everything you need, all sewn together and in one piece. It has an absorbent layer attached to the waterproof material. You do not need a separate cover. 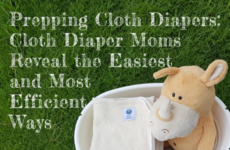 It is by far the easiest option in cloth diapering because everything you need is right there for you. You can also adjust the absorbency of the diaper by folding the layers to be thicker in the front (for boys or stomach sleepers) or thicker in the back (for girls and back sleepers). All-in-one diapers are the easiest option when it comes to cloth diapering. However, they are the most expensive option. Because of all their layers, they also take longer to dry. If you’re choosing Pocket Diapers, a newborn would need 8-12 inserts + 8-12 Pocket Diaper Covers – they’re usually sold as a set. Pocket diapers are less expensive than the AIO option above. Pocket diapers are simple to use but they have an extra step to follow. They come in two pieces: a waterproof cover + an “absorbent” piece. Like the image above, the waterproof cover has a “pocket”. The “absorbent” piece goes inside the pocket. The absorbent piece can be a diaper insert, a prefold diaper, or a folded up flat fold diaper. Once the pocket is filled, you place the diaper on your baby, just like you would a regular disposable diaper. What makes this type of diaper easy, is that once the pieces are gathered and put together, it is used like an all in one diaper. Then, when baby soils him/herself, you take the whole thing off, separate the two piece and throw it all in the diaper pail until cloth diaper washing day. Using Diapers Covers + an Absorbent piece. If you choose this route, a newborn would need 4 waterproof diaper covers per day + 8-12 absorbers. Only 4 diaper covers? Yes. Unless diaper covers are dirty or wet, they can be used between changes. For absorbers, you can use prefolds, inserts or flat diapers. You could also use a combination of all these. This is the most cost-effective and flexible solution. You have two separate pieces each with their own purpose. You have the cloth diaper cover that is waterproof – to prevent leaks and contain everything, plus the absorbent layer (of your choice) that absorbs everything baby gives it. You have the cloth diaper cover that is waterproof. This prevents leaks and contains everything. You also have the absorbent layer (of your choice) that absorbs baby’s urine. The concept is similar to that of the pocket diaper (above). Instead of having a waterproof cover with a pocket + the absorbent layer, you now have a waterproof cover with a sleeve + the absorbent layer that tucks into the sleeve, (see image above). It’s very simple. A pocket diaper is a waterproof diaper cover with a pocket. In the pocket, you add an insert as the absorbent layer. Instead of having a waterproof cover with a pocket + the absorbent layer, you now have a waterproof cover with a sleeve + the absorbent layer that tucks into the sleeve, (see image above). It’s very simple. 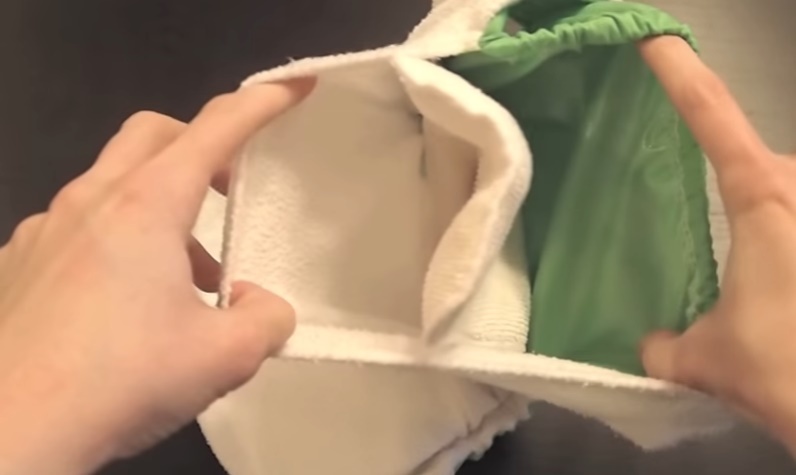 A diaper cover has a sleeve, instead of a pocket. In the sleeve, you add any absorbent layer your prefer, like in the image above. It’s very simple and flexible. So you might be thinking – what’s the big deal about sleeves and pockets? Well, the beauty of having a cloth diaper cover is that when baby soils it, you just remove the soiled part and you continue using the diaper cover. Cloth Diaper Covers themselves will usually not be stained between changes, which means you can reuse them. Most parents discover that they can use one cover for up to six times before it needs to be washed. The beauty of having a cloth diaper cover (with a sleeve), is that when baby soils it, you just remove the soiled part and you continue using the diaper cover. Cloth Diaper Covers themselves will usually not be stained between changes, which means you can reuse them. Most parents discover that they can use one cover for up to six times before it needs to be washed. They’re very economical because you don’t have to buy as many as you would with pocket diapers. Your diaper cover can be made of polyester, nylon or wool – it can be waterproof or not waterproof. Diaper Covers have fasteners like snaps or hook & loop, or they can be pulled up like pants. (Diaper covers that pull up like pants, do not have sleeves. Therefore you would not be able to use inserts with a pull up. Instead, you would use a flat diaper or a prefold diaper). They come in sizes from newborn to toddler. Keep in mind that the type of cloth diaper you choose will depend on how many you will need. For example, if you choose a wool diaper cover and it gets wet, you will need to change it for a new diaper cover. However, if you use a waterproof diaper cover that can simply we wiped when it gets wet, you can simply wipe and reuse it. Here are a few examples. (In the content below, I’m referring to waterproof diaper covers that can be reused). Diaper covers come in sizes from newborn to toddler. Keep in mind that the type of cloth diaper you choose will depend on how many you will need. For example, if you choose a wool diaper cover and it gets wet, you will need to change it for a new diaper cover. However, if you use a waterproof diaper cover that can simply we wiped when it gets wet, you can simply wipe and reuse it. Here are a few examples. (In the content below, I’m referring to waterproof diaper covers that can be reused). Keep in mind that the type of cloth diaper you choose will depend on how many you will need. For example, if you choose a wool diaper cover and it gets wet, you will need to change it for a new diaper cover. However, if you use a waterproof diaper cover and it gets wet, you can simply wipe and reuse it. Here are a few examples. (In the content below, I’m referring to waterproof diaper covers that can be reused). Using a diaper cover plus an absorbent layer is a little extra work. Instead of just putting on the diaper (like you would with an AIO or pocket diaper), you first have to add the absorbent layer, then the outside waterproof layer. It is extra work but it’s very easy and quick to do. You put the absorbent layer, (a prefold or flat diaper), directly onto your baby. Then add the waterproof cloth diaper cover. You could (1) use a flat fold diaper or a prefold diaper, (2) FOLD IT into shape, (3) use a snappi/ diaper pin or boingo to put it on your baby, and finally (4) put on the cloth diaper cover. Slightly harder to do but let me assure you – this is the most economical way to cloth diaper your baby AND it’s easy to do once you have the hang of it. Many parents prefer to use prefolds or Flatfold diapers and covers during the newborn phase because they are the cheapest choice when a young baby needs so many changes each day. you could fold a prefold diaper. If you choose this route, a newborn would need 8-12 snapped inserts + 4 diaper covers per day because diaper covers can be wiped between changes if they’re clean. All in two diapers are a combination of the above. It’s the cloth diaper industry’s way of trying to make things simpler for us. With all in two diapers, you have your diaper cover but instead of sliding a diaper insert or a prefold into the corners like the image above, you can now snap an insert into the cover. Then, when baby soils the insert, you simply unsnap it and throw the insert into your diaper pail. If the diaper cover is still clean, you reuse it. It’s cost effective in the sense that you’d need less diaper covers but inserts with snaps are not necessarily the cheapest option. The difference between using a cloth diaper cover with an absorbent layer and using an all-in-two diaper is that with the former, you slide the absorbent layer into the sleeves and with an AI2, you snap it in. The convenience of snapping it in costs a little more though. If you wash daily, you don’t need as many diapers. 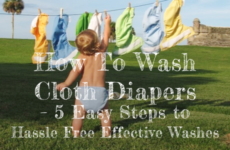 If you have a very big cloth diaper stash, you don’t need to wash too often. However, you really should wash every other day or at least every 3rd day if you want to prevent the dreaded ammonia and barnyard smell that comes from diapers that sit in urine for prolonged periods. Getting yourself into a good cloth diaper washing routine, is a very good idea. 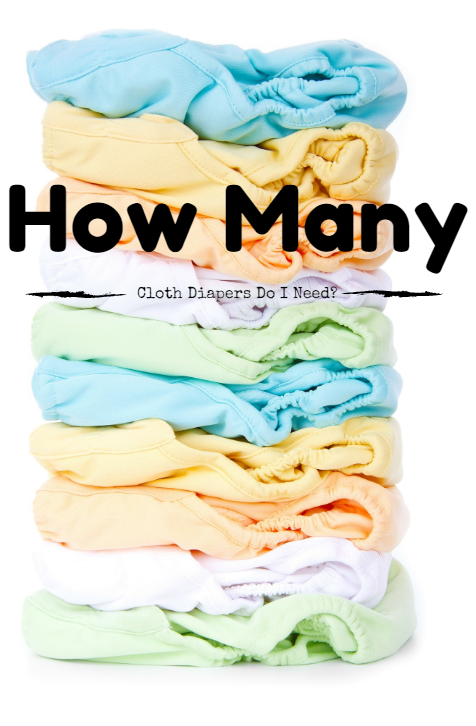 So, figure out how often you plan to wash and that can help guide you as you decide how many cloth diapers to buy. Also keep in mind that if your cloth diaper stash is smaller, you’d have to wash regularly. If this works for you – great. The challenge with that is that your diapers will wear out much sooner. If you are cloth diapering one child and you have no plans on cloth diapering another, then this will likely not be an issue for you. But, if you do hope to cloth diaper several children, it’s a good idea to expand your cloth diaper stash a little bit so as to increase their longevity. Also you need to take into account your drying abilities. If you are drying your diapers outside and you live where drying diapers during winter or the wet season will take longer, consider having some extra diapers to cover during those times or take a look at the faster drying options. You can also rotate which diapers you use so that the same ones do not get washed over and over again. This helps to extend the life of the diaper as it gets a little break from washing once in a while. Most cloth diaper experts recommend a supply of 24 diapers if you only use cloth diapers and you wash every 3 days or so. This allows you some breathing room. At the newborn stage, even with a cloth diaper stash of 24, you will probably wash daily or at least every other day. But, by 6 months you should only be washing 2 or maybe 3 times a week. Keep in mind that it is more cost-effective and ecologically friendly to wash full loads rather than small loads. Yep, baby’s size (not only baby’s age) is ALSO important because its a great indicator of how many diapers of whichever size you will need. For example, most babies are born at approximately 5-8lbs. But, one-size cloth diapers start at around 8-10lbs. So, your healthy newborn baby may be too small for the one-size cloth diapers. So if you were planning on using 8-12 diapers a day and you buy only one-size diapers, you are going to have a little problem in that you won’t be able to use them until baby hits 8-10lbs. Now you may say – well, this is not a big deal – so he/she will look extra tiny in their big diapers for a while. The problem is that if the diapers don’t fit well, they will most likely leak, particularly around the legs and waist. You may have forked out a lot of money for the top of the line diaper covers that don’t leak, but you cannot fault the diaper company if there are leaks because baby is too small. If you think your baby might be on the small side, you might want to invest in perfectly sized diapers, for example newborn diapers. In fact, some moms like Kate Skero from Nourishing Little Souls say that perfectly fitted diapers are the way to go. So now you’re thinking – what do I do, how do I prepare for my baby? My answer is this – slow down. I know how tempting it is to get everything set up while you’re going through the nesting phase of your pregnancy, but if you want to save money, slow down. Wait until you have a good idea of how big your baby will be. This could of course be a problem because I remember them telling me that one of my baby’s were going to be 8lbs, and he ended up being 6lbs. Even so, your doctor will have a good idea of the weight and you can use that as an estimate. I’d recommend that based on what you know, you buy the first lot of cloth diapers. This could be 12+ newborn diapers to get you started. The other reason I recommend that you do not rush, is because some babies are born small but once they’re here, they grow really fast and pick up pounds like crazy. You can’t know this until baby is here. 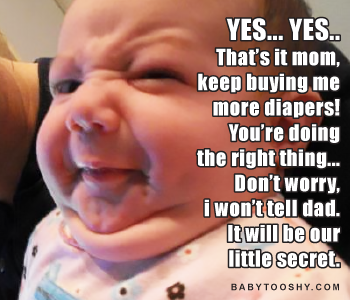 So yes, you want to be prepared but you will need to balance that with a few other things, like do you want to spend money on diapers that you may not use for months, or diapers that you only use for a few weeks? WHAT ARE THE OTHER THINGS I NEED? You will want at least one cloth wipe for each diaper. In the early months you will want more since changes can be a bit messy until your baby starts taking solids. I suggest at least 2-3 dozen so you don’t run out. Also, cloth wipes don’t have to be expensive or fancy. Branded name cloth wipes are cute and cuddly, but some low-priced baby wash clothes will serve their purpose just fine. You will need a place to store your used diapers until you wash them. A lot of cloth households make use of a diaper pail or a trash bin with a recyclable pail liner or a wet bag. Wet bags come in different sizes and are a convenient way to tote diapers when away from home. Diaper sprayers are nice but certainly not necessary. They are a luxury you can do without but once you have one, you will probably not want to do without. (When your baby is exclusively breastfed, their poop is totally water soluble, so breastfed newborn diapers do not need to be rinsed or sprayed off before they go into the washer. I say this part in brackets because even though breastfed baby poops are water soluble, I could never bring myself to throw a poopy diaper in the washing machine, but you may feel different). As soon as your baby starts taking solids, the poop might take on a peanut butter texture and be more effort to remove from the diaper. This is the time when a scraper and a diaper sprayer will be useful. Usually, once your baby is eating a lot of solids and develops firm poops, you can just shake the poop into the toilet. Some babies take a long time to reach this stage though, so if you are tired of scraping off sticky poop and swishing in the toilet, a sprayer can come in handy. I did my best to really lay things out for you but even as I typed this, I realized that it could be confusing to a newbie. I’m sorry if it is. I wanted to give you all the information you need yet, make things clear. I hope I was able to do that because there are so many nuances and in cloth diapering, so much depends on your personality. For example, are you the kind of person who does laundry daily, or is using flat fold diapers with covers your thing. So, read through and try to figure out what would suit your personality and your lifestyle best as you try to answer the question of how many cloth diapers do I need”. Good Luck! If you decide to cloth diaper your baby, you will want to know how many cloth diapers to buy. I fully explain what you need, how many and delve into the factors that will influence the amount of diapers you will need.